EasyMorph Server comes only in a 64-bit version and only for Windows. EasyMorph Server runs projects created in EasyMorph Desktop. Download EasyMorph Desktop. 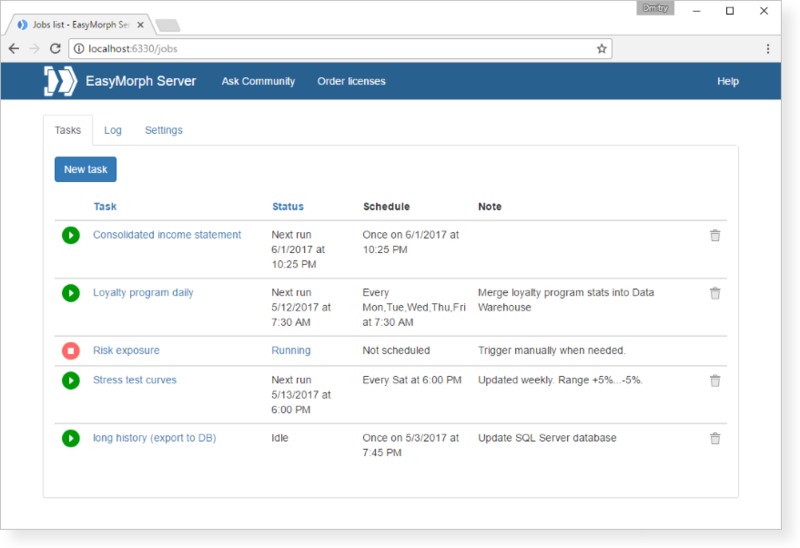 By default, the EasyMorph Server service runs under NT AUTHORITY/LocalService account, not the account used for Server installation. Make sure that your data files are accessible for the LocalService account. It is advised to have >32GB of RAM if your typical datasets exceed 1 billion data points (i.e. rows x columns). Version 3.9.3 build 8 for Windows; 28,706KB (zipped). By downloading EasyMorph Server you confirm that you agree with the End User License Agreement. For evaluation, download and install EasyMorph Server. After installation you will be automatically forwarded to the Settings page (log in as adminstrator). Copy and send the digital signature from that page to . A 30-day trial license key for EasyMorph Server will be sent to you within 24 hours.